PBF Color Luminity is the demipermanent without ammonia coloring line that meets the most frequent colour requirements and interprets the trendiest fashion dictates with a flawless technique. For professional use only. PBF Color Luminity is the demipermanent without ammonia coloring line that meets the most frequent colour requirements and interprets the trendiest fashion dictates with a flawless technique. It gives hair a super radiant color and regenerates them thanks to its technological formulation based on the fusion of two innovative active ingredients, Luminescina and Re-Texture Complex. Moreover, it naturally covers grey hair without lightening the base. Luminescina is a patented, next-generation natural ingredient, that absorbs and converts the UV radiations into a new light source, that is generated directly on the hair increasing their radiance. Luminescina is obtained from the petals of the flower of mullein, a plant found throughout the Mediterranean area and is also found in Italy, in the province of Syracuse. Re-Texture Complex is a molecule derived from silk and covers the entire surface of colored hair with a silky and resistant film giving the hair a soft and smooth texture. Moreover, it secures the pigments of color inside, maintaining the intensity of color over time. 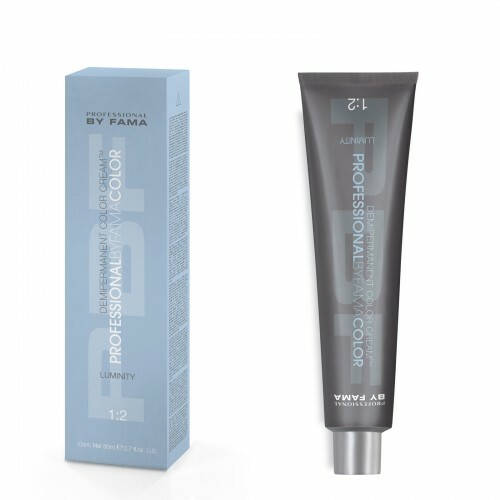 1:2 dilution ratio with Professional by Fama Color Developer 10 and 20 vol. BLOND CHIC 15 minutes a month to create from the dark base the best blonde ally. How? Giving shading a natural appearance, avoiding unsightly color changes on areas of red in the darker parts, removing overly evident color differences. PURE BRUNETTE just 15 minutes a month to enhance the natural notes of hair without unwanted red effects. How? Giving a warm but not red result, enhancing the natural color of the hair, creating depth and movement. NATURAL SUN enhances the beauty of shades for that sun-kissed effect. How? Redefinig blonde contrasts, recreating the unique style of highlights as if it were the first time, regenerating the color and structure of hair. The payment for the ordered products are either by charging any of the cards (type VISA, MASTERCARD or EUROLINE) or via bank account (Comi ’s cooperative bank) , or cash on receipt of products. • The number of authentication of the card is printed in the space reserved for the signature of the Holder (CVV / VISA or CVC / MC). In case of disputed transactions request (valid only for credit card transaction), the Holder shall submit a request to challenge himself to the issuing bank's card. Payment on delivery will be made in cash at the time of delivery of the products. Note that it is not possible to delivery for purchases over 500 EURO.